Every driver knows that it’s wrong, in any situation, to use your phone whilst at the wheel – or do they? With the government cracking down on this, people might not know the full consequences if they’re caught with a phone in their hand whilst driving. You can risk getting a hefty fine, points on your record or even have your licence taken away completely. Before we look at our survey results, we’ll take a quick look at the facts. 582 new drivers were disqualified or had to re-sit their test as a result of using their mobile phone. · have a device that blocks your view of the road or traffic ahead. In short, the police can stop you if they think you’re not in control of the vehicle because you’re distracted, and you could be prosecuted as a result. This could include 6 penalty points and a minimum £200 fine. In particular, young drivers, or those who have passed in the last two years, should be aware of these rules as you could lose your licence completely if you’re stopped as a result of using your phone. But how many of the people we surveyed were aware of this and how many thought it was fine to use a mobile whilst driving? Our results showed that those in the 18-24 year old category were more sensible than their older counterparts, as almost 41% said that they would never use their phones whilst driving, compared to just 26% of the 25-34 year old respondents. In fact, over a quarter of the latter age category thought it was okay if the roads were quiet. 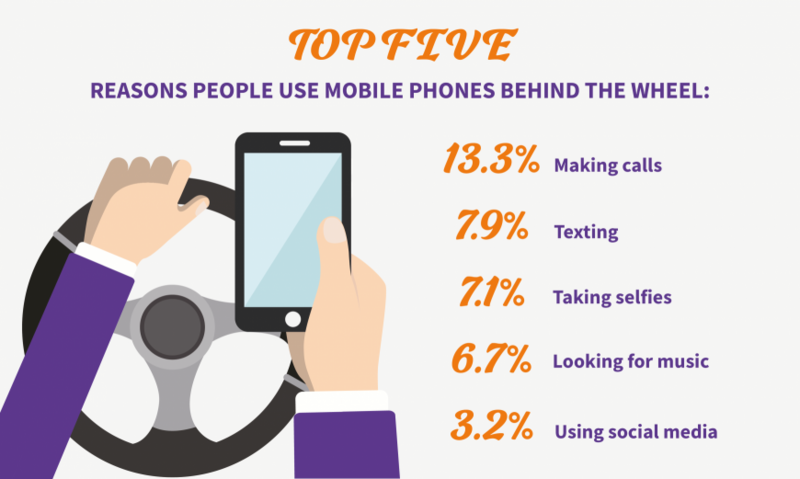 Within the younger bracket, 24% said that they used their mobiles at the wheel to make phone calls, whereas taking selfies was popular among the 25-34 year olds, with nearly 18% admitting to doing this. Young women seemed to be the more sensible drivers as 57% thought it was never okay to use a phone, compared to just 20% of men. Plus, 14% of male drivers thought it was okay as long as the roads were quiet, in comparison to 10% of the women we asked. Where Are the Safest Drivers? Our survey revealed that it was Southampton’s drivers that seemed to be the safest, with over 74% of people saying that they’d never use a phone whilst they were driving. On the opposite end of the spectrum, it was in London that the most people thought it was okay as long as the roads were quiet – 15% of them admitted to taking selfies and texting behind the wheel, and almost 20% said they’d make calls. In Manchester, 11% of young drivers took selfies whilst in the driver’s seat and 8% checked their social media feeds. Further up north, 13% of Glaswegians said that using a mobile phone was fine, as long as people don’t get caught doing it. Is It Ever Okay to Use Your Phone? So, it seems like the perceptions of many young people or new drivers is that it’s fine to take a selfie, make a phone call or check your Twitter or Facebook feeds as long as the roads are quiet (or if you don’t get caught). However, we don’t think you should risk the serious consequences of using your phone whilst driving. In conclusion, the perceptions around using your phone whilst driving need to be changed as people can face tough penalties, especially new drivers who have held their licence for under two years. So, next time you think it’s okay to text and drive as the roads are quiet, follow the good example set by most of Southampton’s drivers and put your phone away.